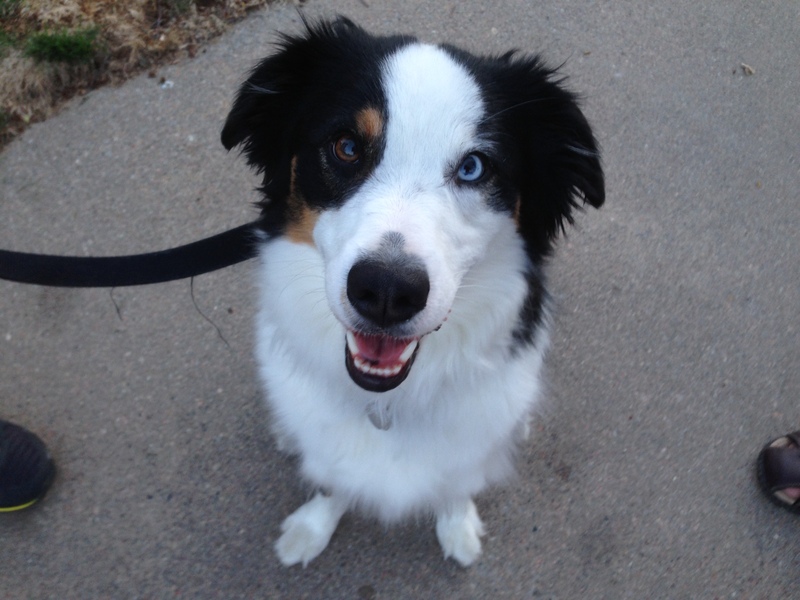 Dewey is a two year old Miniature Australian Shepherd who barks aggressively at visitors, gets over excited when anyone knocks on the door, is reactive to dogs and people when out for walks and occasionally chases neighborhood kids who run or bike past his front yard. When I first met Dewey, he was barking an alarm with the family’s other dog, an older Corgi mix who is almost completely deaf. Dewey’s owner was holding him back by his collar and had his front legs off the ground. Before she opened the door I asked her to let Dewey go. Before his owner got to the door, I had noticed that Dewey was barking while standing a few feet away and the bark itself didn’t have an aggressive tone to it. After Dewey’s owner let go of his collar, his barking continued but was less intense. He was keeping about two feet away form the door so I cracked it just enough to allow the dogs to sniff my leg. As soon as they started sniffing, the barking stopped completely. I was looking down at the dogs as they sniffed to gauge their behavior and keep an eye on Dewey as I knew he had a history of nipping some guests. After giving me an initial sniff, Dewey looked up and we made direct eye contact. As soon as this happened, he backed away and started barking again. To some dogs, direct extended eye contact can be interpreted as a challenge and based on his reaction, this is how Dewey took it. While I would have preferred to avoid the direct eye contact, the resulting behavior gave me some insight on Dewey and his mindset. Each time he barked, he took a step backward which is usually a sign of an insecure or nervous dog. I opened the door but remained still so I could observe Dewey’s reaction which remained the same. After a handful of barks, he had moved himself back about 15 feet away from the door. His room mate stayed in place and spent the next minute and a half sniffing me before walking way. Only after the dog walked away did I come inside. As soon as I stepped in, Dewey’s barking increased in frequency and intensity, but he continued to move back. As I walked in he continued to retreat so I followed him in a casual way. I think this reaction startled Dewey who was used to his owners holding him back or the people he was barking at backing away themselves. Dewey backed himself into the hallway and once there, he turned and went into one of the bedrooms to jump on the bed. After checking with his guardian first, I grabbed a leash and followed Dewey into the bedroom. Dewey jumped up on the bed and continued to bark until I came into the bedroom itself. As soon as I got close, he stopped barking. He feigned a few times as if he was going to move or run away, then stopped and steadied himself. For dogs, the height they sit at has a correlation to their rank or status and Dewey was torn between his insecurity at this new guest who wasn’t backing away and a reluctance to give up the status the bed position offered him. I offered the leash in front of Dewey and let him sniff it before continuing. I revered the leash to create a lariat of sorts, then dropped it over Dewey’s head. Dewey didn’t move and was showing a stiff body posture and halted breathing so I waited a moment before giving a firm tug on the leash to get him up out of his sit. As soon as he got up, I let the tension fall off the leash and waited again. After a moment, his breathing returned to normal and his body posture softened a bit so I gave another firm tug on the leash to get him to jump off the bed on his own. Dewey took my lead and jumped off the bed then stood motionless on the floor. I wanted to make sure he didn’t shut down as a coping mechanism so I used the leash to lead him back into the living room. His guardians had surprised looks on their faces as he walked with me back into the living room. I took a seat and stepped on the leash about two feet away from Dewey’s collar. I wanted to prevent him from going into a fight or flight state, but also help him experience my presence on his own. I offered no eye contact, didn’t try to pet him and directed my attention to the conversation with his guardians. A minute later, Dewey laid down on the floor. When you are dealing with an unbalanced dog that is insecure, its important to let the dog initiate the contact and interaction. A few moments after sitting down with his guardians, Dewey took a seat himself next to me. A minute later, Dewey laid down on the floor facing me. Dogs rarely sit or lay down when near a person or animal they do not trust, so Dewey assuming these positions on his own told me he was relaxing and getting more comfortable. Over the next four hours I went over some basic non verbal communication methods, how to properly walk the dog, ways his guardians can redefine the leader follower dynamic and a few exercises that will help him learn to develop the ability to restrain himself. Combined with his owners taking over the leadership position in his eyes will help Dewey stop being so reactive to new people and dogs. Dewey’s owners were relived to find out that he wasn’t an aggressive dog. His reaction was coming from a place of insecurity and he was barking and lashing out in a preventative way. This is not to say that Dewey won’t nip or bite if confronted in the wrong way or a situation he isn’t equipped to deal with. As his owners take over the leadership activities that Dewey had been active in (barking at guests, reacting to passers by, etc), he will learn to relax and go back to being a fun loving dog. By the end of the session, Dewey was listening to his guardians commands and corrections immediately. Best of all, his guardians timing, energy and leadership had improved significantly. It will take time, patience and practice, but I see no reason why Dewey can’t learn to stop being so reactive and leave security and the responsibility of leadership up to his guardians. When that transformation is complete, the remainder of Dewey’s issues should dissipate completely.